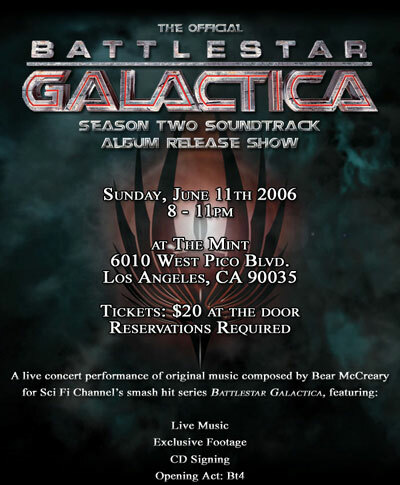 Last Sunday June 11th marked the first live concert performance of my score for the new Battlestar Galatica. 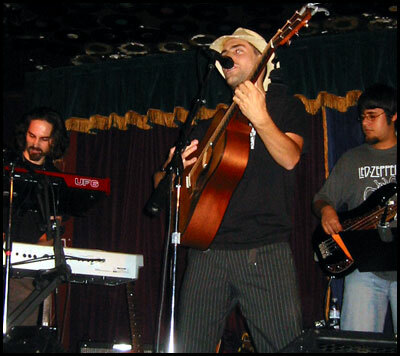 The event took place at The Mint in Los Angeles and featured 3 sets of live music, exclusive video footage and a CD signing with the entire musical ensemble. 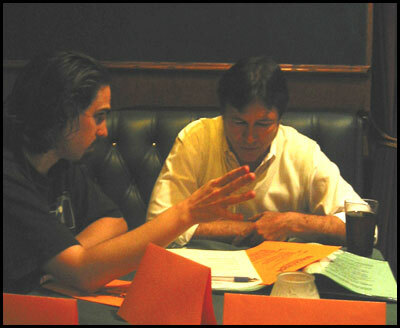 The evening was hosted by veteran Galactica star Richard Hatch (Capt. Apollo – original Galactica, Tom Zarek – new Galactica). I was honored especially that original Galactica composer Stu Phillips was in attendance as well as Galactica writer / producers Bradley Thompson and David Weddle and Galactica sound designer Daniel Colman. Richard Hatch introduces the first video presentation. The ensemble on stage consisted of the very same amazing musicians who bring my music to life every week, including Oingo Boingo alums Steve Bartek, John Avila and Johnny “Vatos” Hernandez. 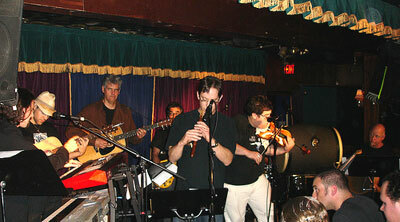 Also on hand were Paul Cartwright (electric fiddle), Chris Bleth (ethnic woodwinds), M.B. Gordy (percussion), Bt4 (vocals and guitar) and special guest Raya Yarbrough (vocals). I also got to leave the studio for a few hours and play keyboards and conduct! The evening opened with a set from Bt4, a pop/rock band I play keyboards and sing with. The lead singer / songwriter, Bt4, is a frequent vocalist on Battlestar Galactica, though this set featured a considerably more pop-friendly vibe. He said that, in honor of the occasion, he changed the name of his song “My Apologies” to “My Apollo… Geez!” No one laughed. I thought it was really funny. I’m sure that when you guys got home and it had a minute to sink in, you all cracked up. The band. Vatos is behind the big taiko drum… somewhere. 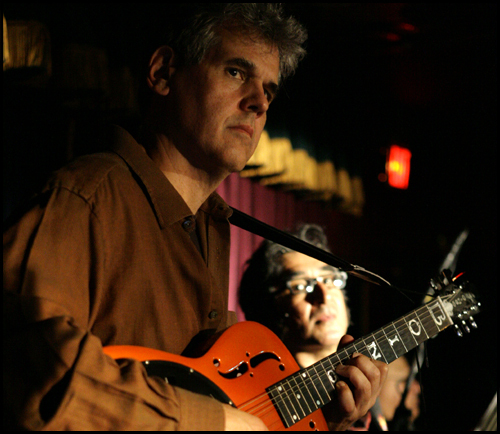 … while Bt4, Steve Bartek, John Avila and Vatos lined up in the back. 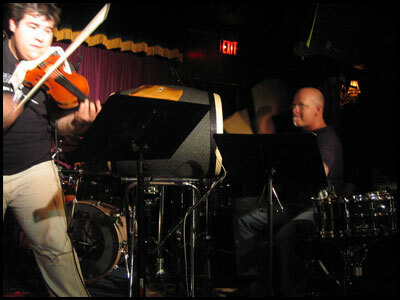 My keyboard rig was off to the far side, perched in just the right spot where everybody in the band could see me conducting and watch for cues. Between Steve Bartek and Bt4 there were 5 guitars crammed on the stage: 2 electrics, 2 acoustics and a dobro (for The Cylon Prisoner). 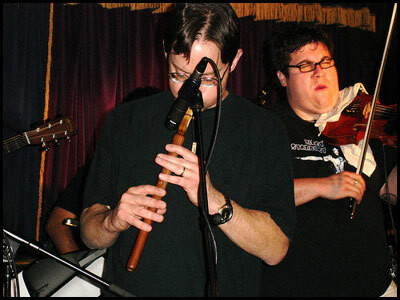 Chris Bleth brought his usual assortment of ethnic winds, including the duduk (pictured), bansuri and chinese flutes. He also played alto and concert flute. 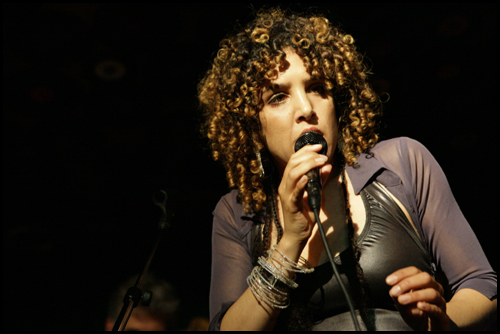 Raya Yarbrough lent her unique vocal talents to two songs, including “Lords of Kobol” from Pegasus. She was a frequent vocalist on Season One as well, performing ambient vocals on the US Main Title Theme. Despite being featured on many score cues, Lords was the first piece with lyrics she sang for Galactica. Sound engineer Steve Kaplan checks the frequently changing levels from behind the board. 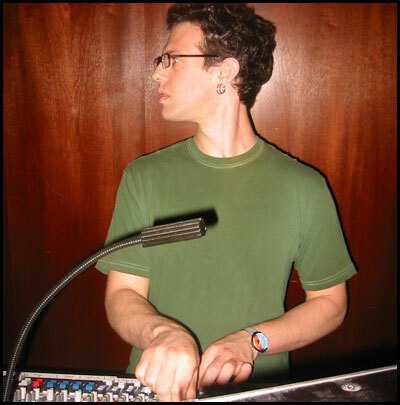 Steve is my co-producer / engineer / mixer / recordist for Galactica. Every piece of music you’ve ever heard on the show goes through him after it leaves my brain, and the live show was no exception. He was on hand making sure the delicate balance between the soft duduk and thrashing rock band elements was maintained (as best as it could be!). Bear and Richard discuss last minute details before the show. 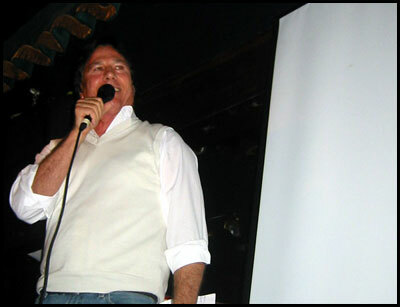 Richard was a great addition to the show’s line-up and gave a hilarious speech detailing the links between the original Captain Apollo and Tom Zarek. M.B. Gordy could only fit a single taiko on The Mint’s stage, but it was more than enough to fill the room with pounding-drummy-goodness. He also brought Middle Eastern frame drums, a dumbek and a barrage of cool little percussion toys. One of these days I want to show all you guys the full arsenal of drums this guy uses on the recording sessions. 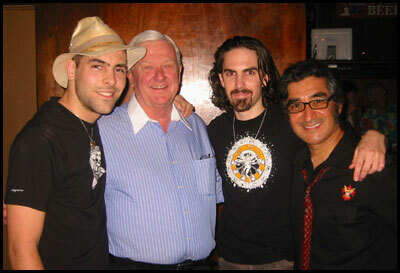 I had many friends and family in attendance, including Jim Hopkins, my teacher and mentor from college. This guy taught me everything I know about orchestration and walked me through my first orchestral composition many years ago. 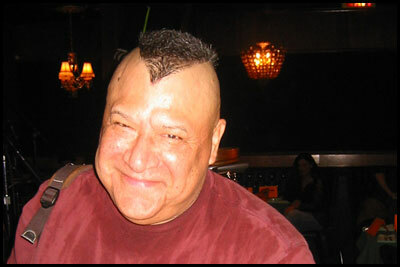 Vatos, still smilin’ at the end of a long night. I owe a big thanks to everybody who helped bring this show together, but especially the crew of The Mint, Richard Hatch, Matthew Gilna (who produced the DVD documentary material we screened), John Murphy (who donated orchestral footage for said documentary) and Steve Kaplan. Extra special thanks to Patrick Crowley, Gary Griffith and Raya Yarbrough for the photos!